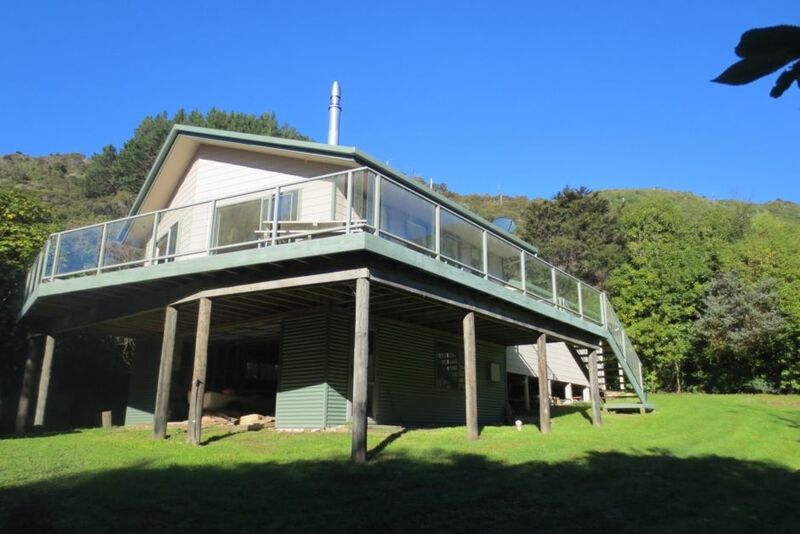 Fancy a relaxing holiday in the Marlborough Sounds where you can get away from it all? Then look no further than this fabulous holiday home in Moetapu Bay, Mahau Sound, Marlborough. To obtain an accurate quote, please ensure you are viewing the property through the New Zealand website. www.homeaway.co.nz Other sites show prices in other currencies. An easy 40 minute drive from Picton and just 30 minutes from Havelock. You’ll wake up to the tuis and bellbirds, enjoy your coffee on the deck and stroll down to the beach for a spot of fishing, a swim or a kayak. Children will be delighted with the miniature glow worm dell in the creek on the property. This hidden gem is a modern three bedroom home nestled in bush just a stone’s throw from the beach and launching ramp. It has easy drive on access with plenty of room to park your cars and boat. The lovely flat top section is perfect for ball games. An ideal summer get-away, this home is also an excellent winter holiday spot complete with log fire. Easy access to local walks, a short drive to the Queen Charlotte Track and a good base for mountain biking. A great base for day trips to Nelson, Picton, Blenheim and all the fantastic wineries Marlborough has to offer. 1 bathroom and two toilets. Great value at $130-$190 a night for four people (peak and off-peak prices apply). Add $20 for each extra adult per night and $10 each for extra children per night. * 20% deposit required within 5 days of requesting a booking. * STRICTLY NO PETS-this is in consideration of the native birds and wildlife, and the neighbours. * Smoking allowed outside only. * Two creeks on property-small children must be supervised at all times. * Stairs from deck not barricaded-again,supervision of children essential. *If you wish to use the dinghy, you will need a tow bar on your vehicle to take it to the launching ramp. Private and peaceful. Surrounded by bush and birdsong with two creeks on the property. A short walk to the beach. Ideal location for boating, fishing, swimming and bush walks. Comfortable house situated in a great place. We enjoyed our weekend here. Thanks very much. A great private spot with an abundance of wildlife surrounding the Bach. Quail, Kereru, Tui, fresh water trout and crayfish as well as an eel all on the section (as well as the glow worms). Nice, clean house with everything you need. It was VERY hot in the house but the mosquito nets over the windows were a lifesaver. We didn’t end up launching our boat in the bay as the launching ramp wasn’t really suitable. Thanks. I'm glad you enjoyed your stay. What a great place. a lovely private haven tucked away in the bush. a little nature land for bird life. I loved it. So pleased you enjoyed your stay. The bird life is wonderful, isn't it?